Geoscientists at Maersk Oil needed accurate models, and they used a variety of quality check techniques to generate these models with the lowest uncertainty possible. After seismic data has been processed, a geomodel created, and the reservoir grid generated and populated, a well-known quality check populates the reservoir grid using elastic attributes (Vp, Vs, density…) computed from simulated or interpolated rock properties such as porosity, fluid saturation, mineral composition, etc. From these properties, is possible to generate the theoretical seismic response of the reservoir, and to compare that to the actual field response. Maersk Oil also wanted to standardize and incorporate petrophysical models from different formats (Excel spreadsheets) into the same geomodeling software within Petrel. Because of the high degree of customization required, and INT’s expertise in creating geomodeling software, Maersk Oil chose INT to develop a specialized workflow which would integrate the petrophysical population of the grid and the synthetics generation. Generation of synthetic time seismic cubes using Zoeppritz equations (full offset and customizable angle substacks), from the depth grid and the generated Vp, Vs, density. Lots of visual or textual indicators, extensive documentation, and preset parameters to assist the beginning user while still allowing experts to have full control of the algorithms. Two versions of the Petrel plugin (for Petrel 2009 and 2010) have been delivered to Maersk Oil as simple executable EXE files. They incorporate a setup program that properly installs the plugin onto the computer, and then configures Petrel properly so that the plugin can be loaded into Petrel. This plugin is Maersk’s first proprietary plugin. 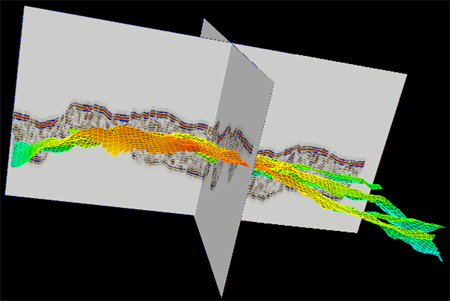 Named Mod2Seis (which stands for Model to Seismic,) the plugin is currently used by Maersk Oil to generate synthetic seismic from existing geologic models and determine a +match to the original seismic data. In the case of mis-match, the geologic models are updated, using seismic attribute volumes to constrain the models with the seismic information. This process is done iteratively until a good match between the modeled synthetic and the seismic data is achieved. Maersk Oil is an international oil and gas company, ranked among the top 30 independent oil and gas producing companies world wide. The company is known for its ability to push technical and operational performance through innovation, and its ability to turn marginal and challenging fields into commercial successes. Learn more at www.maersk.com.